Agree completely, Jeff...and am very worried at the ubiquity of the ESV on US Christian websites (I live in NZ); particularly as the default version of RefTagger, which is a great service, but clearly part of the "relentless" marketing of Crossway. I fear that the big battle for the TR/MT was lost years ago in the seminaries when they were allowed to bring in the N-A text (just a gussied-up W-H), thus undermining the KJB. Of course, the war still goes on in the provinces! Thanks for the feedback from "the provinces." Yes, to defend the AV and its traditional text is seen by most as a "lost cause," particularly among those who have been to seminary (even and sometimes especially evangelical ones). I think you misread the copyright issue. It is based on the RSV, which is copyrighted by the NCC. 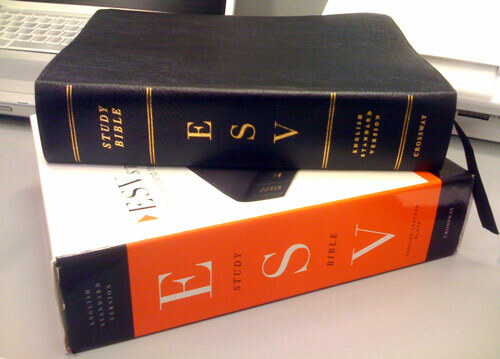 The ESV is not connected with the NCC, any more than the KJV is connected with the Pope, to whom Erasmus dedicated the TR. Having said that, I do admit your points 2 and 3 remain, and are more than a little concerning. By way of disclaimer, I do prefer the KJV. I do not believe I have misread the copyright info. I believe Crossway had/has some arrangement with the NCC to use the RSV as the basis for the ESV. I'd love to see Crossway directly address the issue through a statement or explanation of some kind. As for your comments on Eramus being RC: It is a common tactic among those who promote the modern critical text and who want to discredit the TR to note that Erasmus was RC. In response we might observe that when Erasmus published his first ed. of the Greek NT in 1516 Luther had not yet posted the 95 Theses (1517). Everyone in the Western world was RC. Also, the traditional text used by the Reformed translators was, in fact, an edition from Beza, though based on Erasmus' work. Anyhow, glad you found points 2 and 3 more convincing. Christian Century reported in an August 2002 issue that Crossway paid the NCC $625K in advance royalties. The magazine reported that rather than pay the fee over 10 years, the payment was a lump sum. 1. Do you have the specific info on the CC article (date of issue, volume, number, page number)? I looked at the their online archive and there were two issues in August 2002 (Vol. 119 Nos 17-18, August 14, 28). None of the article titles I saw seemed to be about the subject (you have to pay to read the articles, which I did not). Perhaps it was in a news summary that is not posted in the archive. 2. If the sum is correct, how was it calculated? 3. If this was for "advance royalties" what, if anything, has been paid since 2002? Hi saints. Pretty good article on the ESV. I have a lot more on this new Vatican Version, and I really mean Vatican Version. The Nestle Aland 27th edition comes right out and tells us that the ever changing UBS/Nestle-Aland critical Greek text is under the direct supervision of the Vatican to create an "inter confessional" text to help unit the separated brethren. The ESVs (3 different editions in just 10 years) often rejects the Hebrew readings and adds hundreds of words to the Hebrew text from the so called Greek Septuagint. There are many things wrong with the ESV and here are some of them from my own studies. The Ever Changing ESVs 2001, 2007 and 2011 = just another Vatican Version. Very interesting, Hugh. Thanks for sharing. You're most welcome! Thank you for you work on this important topic!